Jazan Economic City will become a key contributor to Saudi Arabia’s economy as current infrastructure and projects development will provide a solid base for further investments in heavy and secondary industries, petrochemicals, mining and conversion industries, Khalid A. Al-Falih, president and CEO, Saudi Aramco said at the Jazan Economic Forum (JEF) today in Jazan City, southwest of Saudi Arabia. The forum is being attended by over 500 Saudi Arabian and foreign dignitaries and business leaders, and is showcasing investment opportunities at the Jazan Economic City (JEC) project. The Forum was inaugurated by HRH Prince Mohammed bin Nasser bin Abdulaziz Al Saud, Governor of Jazan Province, HE Ali bin Ibrahim Al-Naimi, Minister of Petroleum and Mineral Resources, HE Abdullatif A. Al-Othman, Governor of Saudi Arabian General Investment Authority (SAGIA) and Saudi Aramco’s Al-Falih. In his opening remarks, Al-Falih said the company was proud to play a key role in the development of Jazan. He said Jazan Economic City was part of the Saudi Government’s vision to create economic bases across the Kingdom to achieve a diversified economy and balanced regional development. “The Jazan Economic City vision seeks to invest in the region’s natural resources, diverse geographic features and human resources to make a major positive difference to the area's future, so that Jazan will become a significant contributor to the Kingdom’s economy,” said Al-Falih. According to Al-Falih, Saudi Aramco will build Phase I of the project which will include smart infrastructure to meet energy, utilities and transportation requirements of a diverse industrial base. “Saudi Aramco has been entrusted to build Jazan’s strategic infrastructure through the development of a refinery and terminal, a power plant, a commercial seaport, a water desalination plant, roads and water and sanitary drainage systems, in addition to connecting electricity,” he said. Jazan’s rich endowment of mineral and agricultural resources makes it ideal for the region to prosper and thrive into a major economic city in the Kingdom, he added. Al-Falih also said that Saudi Aramco has taken a pro-active approach to human capital development for the Jazan people by launching a number of training initiatives to create a highly-capable and qualified workforce, drawn primarily from the area's youth, to fill jobs in all stages of the project. These skills and training initiatives began in 2014 when Saudi Aramco and the Technical and Vocational Training Corporation (TVTC) signed the agreement of the Jazan Contractors Alliance for Training and Employment, also known as "Maharat" by launching two training institutes. “The Saudi Aramco – TVTC alliance is an innovative strategic partnership with the refinery project's contractors to train and employ 5,000 young people from Jazan in various construction-related professions and crafts over four years. 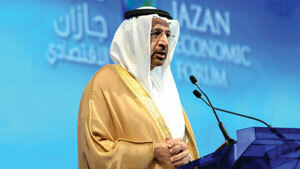 Longer term, we aspire for the number of jobs available in Jazan to reach 75,000,” said Al-Falih.